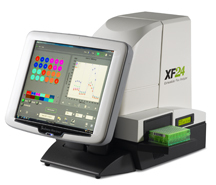 The XF-24 analyzer simultaneously measures the Oxygen Consumption Rate (OCR) and the Extracellular Acidification Rate (ECAR) of cultured cells, isolated mitochondria, islets or small tissue samples. The instrument measures mitochondrial function in intact cells utilizing real-time bioenergetics - the rate of aerobic respiration and lactic acid production via glycolysis, respectively. The system performs label-free, non-destructive measurements, which allow the cultured cells to be used for further assays. 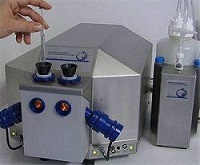 The plate accommodates 24 individual wells, and up to 4 different test compounds can be injected separately into each well. A Cell Mito Stress Test typically injects oligomycin, FCCP, and rotenone and antimycin-A. A Glycolysis Stress Test typically injects glucose, oligomycin, and 2-DG. This service includes consultation with the Core director for proper experiment design, and a first time explanation of data produced. First time users should contact the Core director at least 2 weeks before running an experiment. Users will provide the Core with their cell plate on the day of the experiment. The Core will provide all materials needed to run a standard assay. XF assay takes at least 4 hours. Data will be provided by the next day. The Seahorse Bioscience website has a wealth of information. It is highly recommended that users research their area of interest before beginning an experiment. This service includes consultation with the core director and/or consultant for proper experiment design, and a first time explanation of data produced. First time users should contact the Core director at least 2 weeks before running an experiment. We have space available for preparation of samples for ease of running the experiment (for a nominal fee), or users can prepare samples in their own labs and simply come to the Core when ready to use the O2K. We have two Bruker Minispecs available to measure whole body composition in mice and rats without anesthetics. The LF-90II is great for rats or large mice over 50 grams. The LF50 is designed specifically for mice under 50 grams. Investigators will receive analysis of fat tissue, lean tissue, and free fluid. They are relatively simply systems to use. First time users must be trained by Core personnel. Thereafter they can use the machines on their own. A glucose tolerance test is commonly used in estimating the overall insulin sensitivity in vivo in rodent models. The glucose/insulin will be given intraperitoneally (by injection, IPGTT) after a fast period to deprive food in the GI track. Blood samples are taken at intervals (0, 5, 15, 30, 60, 90 minutes post injection) to determine how quickly the glucose is cleared from the blood as well as the corresponding changes of insulin in plasma. 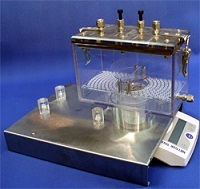 Metabolic Chambers determine whole animal energy expenditure. This is a non-invasive measurement of food intake, energy expenditure, respiratory exchange ratio and physical activity. Promethion and CLAMS have many similarities and some differences. The chart below depicts some of these differences. The Core will provide investigators with a data analysis for Promethion that includes many parameters, averaged for light and dark cycles. The Promethion system records absolute raw data and can be analyzed in many ways. What the Core provides is a basic analysis. Any interest in analyzing data in a different manner should be discussed with the Core director. The Core will provide investigators with a data analysis for CLAMS including HEART, RER, ACTIVITY, SLEEP, and FEED, averaged for light and dark cycles. If you implant the radiotelemeters you can simultaneously calculate core body temperature. Investigators must take special consideration in planning to use radiotelemeters as it requires surgery. Clamps assess whole body insulin action and are considered to be the “gold standard” method to assess insulin sensitivity. Investigators should know we suggest an N=6-8+ per group. The fail rate is ~20% (usually due to clotted catheter, lost catheter, or surgical complication). This procedure investigates glucose metabolism and its sensitivity to insulin. The typical standard for clamps in mice is to study in the conscious state using a chronic venous catheter. Basic clamp: determines solely whole-body insulin sensitivity. Detailed clamp: Tissue specific insulin action can be determined using glucose tracers: 3-3H-glucose (liver) and/or 14C-2-deoxyglucose (muscle, fat, etc). Two doses of insulin are often studied, as organs have differential sensitivity. Lipid and hormonal responses are often measured. The procedure timeline includes surgical catheter placement with anesthesia, 5-10 days postoperative recuperation, then after 4-5 hour fast when the actual clamp is performed followed by euthanasia. If radioactive tracers are used there are post-clamp assays performed that can take 2-4 weeks. This procedure investigates insulin secretion in response to controlled, standardized hyperglycemia. The procedure timeline includes surgical catheter placement with anesthesia, 5-10 days postoperative recuperation, overnight fast, 2 hour acclimatization, and then 2 hours of controlled hyperglycemia followed by euthanasia.